AA024-R, Roman Republic, Q. Sicinius (49 BC) AR Denarius (3.99g) Rome, 49 BC, Obv. 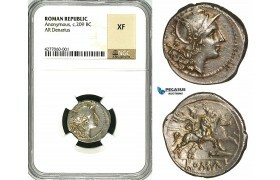 : Diademed head of..
AA025-R, Roman Republic, L. Scribonius Libo (62 BC) AR Denarius (2.92g) Rome, 62 BC, Obv. 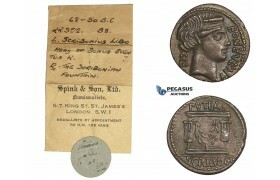 : Dia..
AB984, Roman Republic, Anonymous. Ca. 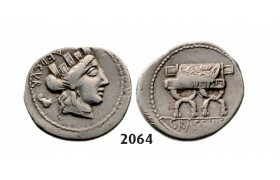 230 BC. 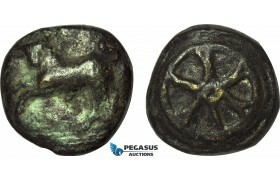 Æ Aes Grave Triens (Ø42.5mm, 102g) Later Cast? 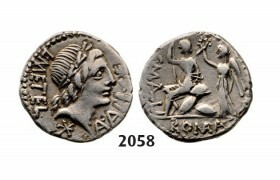 AB984, Roman Republic, Anonymous. Ca. 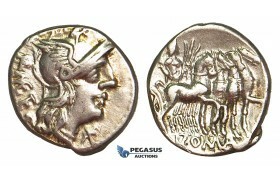 230 BC. 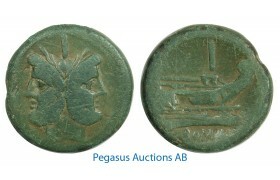 Æ Aes Grave Triens (Ø42.5mm, 102g) Libral..
B35, Roman Republic, AS, Bronze (33.68g) Head of Janus/Roma, Olive Green Patina! 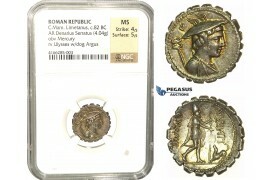 B35, Roman Republic, AS, Bronze (33.68g) Head of Janus/Roma, Olive Green Patina, Crawford 85/2 ..
Roman Republic, L. Procilius L.f. AR Denarius (3.82 g), Rome (ca. 80 BC) Obv. 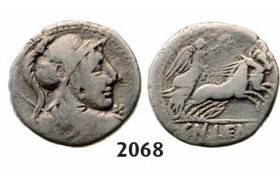 : Laureate head of Jup..
K85, Roman Republic, D. Junius Silanus L.f. (c. 91 BC) AR Denarius (3.91g) 91 BC, Rome, Crawford 337..
K86, Roman Republic, T. Claudius Nero (c. 79 BC) AR Denarius Serratus (3.81g) 79 BC, Rome, Crawford ..
L80, Roman Republic, L. Memmius Galeria (106 BC) AR Denarius Serratus 106 BC(3.87g) Rome, Obv. 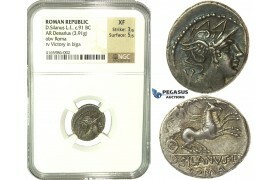 : Laur..
L81, Roman Republic, C. Mamilius Limetanus (82 BC) AR Denarius Serratus 82 BC (4.04g) Rome, Obv. 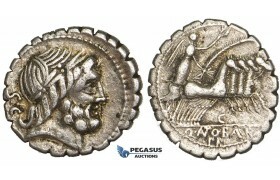 : Bu..
L. Thorius Balbus (105 BC) Denarius, Rome, Silver (3.80g)Obv. 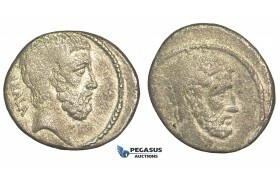 : Head of Juno Sospita right wearing go..
P. Servilius M.f Rullus (100 BC) Denarius, Rome, Silver (3.96g)Obv. : Helmeted and cuirassed bust of ..
L. Caecilius Metellus, C. Publius Malleolus and A. Postuminus Sp.f. 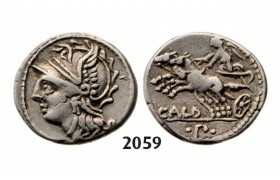 Albinus (96 BC) Denarius, Rome, ..
C. Coilius Caldus, Coelia (90 BC) Denarius, Rome, Silver (3.90g)Obv. : Helmeted head of Rome. Rev. 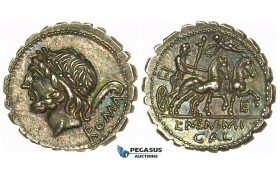 : V..
L. and C. Memmius L.f Galeria (87 BC) Denarius, Rome, Silver (3.93g)Obv. 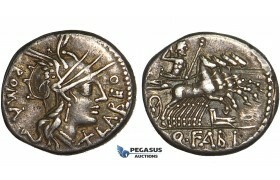 : Laureate head of Saturn le..
P. Furius Crassipes (84 BC) Denarius, Rome, Silver (3.78g)Obv. 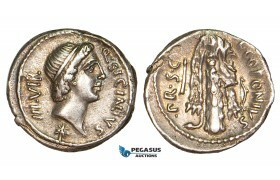 : Turreted head of Cybele right, behin..
Cn. 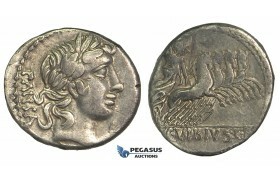 Cornelius Lentulus (76-75 BC) Denarius, Rome, Silver (3.61g)Obv. 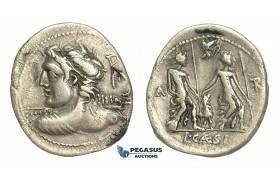 : Draped bust of Genis Populi Ro..
L. Marcius Philippus (56 BC) Denarius, Rome, Silver (3.83g)Obv. 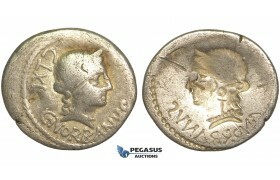 : Diademed head of Ancus Marcinius ri..
O40, Roman Republic, Anonymous (211-208 BC) AR Denarius (3.68g) Rome, Dioscuri, Nice! O40, Roman Republic, Anonymous (211-208 BC) AR Denarius (3.68g) Rome, Obv. 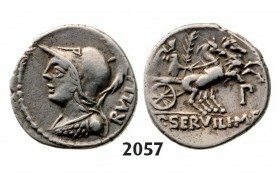 : Helmeted head of R..
O41, Roman Republic, M. Atilius Serranus (148 BC) AR Denarius (3.51g) Rome, Obv. 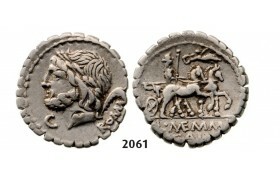 : Helmeted hea..
O42, Roman Republic, Q. Marcius Libo (148 BC) AR Denarius (3.54g) Rome, Obv. 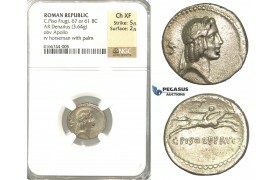 : Head of Roma rig..
O43, Roman Republic, A. Spurilius (139 BC) AR Denarius (3.79g) Rome, Obv. 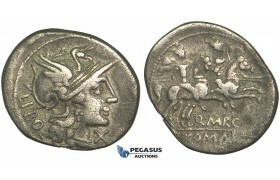 : Helmeted head of Ro..
O44, Roman Republic, L. Minucius (133 BC) AR Denarius (3.82g) Rome, Obv. 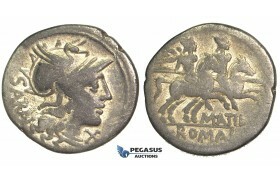 : Helmeted head of Rom..
O45, Roman Republic, Lucius Caesius (112-111 BC) AR Denarius (3.66g) Rome, Obv. 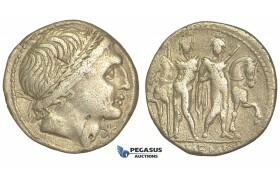 : Youthful, dra..
O46, Roman Republic, L. Memmius (109-108 BC) AR Denarius (3.75g) Rome, Obv. 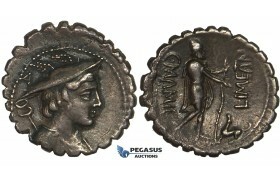 : Male head right, ..
O47, Roman Republic, C. Coilius Caldus (104 BC) AR Denarius (3.81g) Rome, Obv. 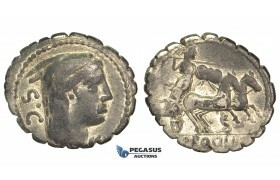 : Helmeted head ..
O48, Roman Republic, L. Appuleius Saturninus (104 BC) AR Denarius (3.64g) Rome, Obv. : Helmeted..
O49, Roman Republic, C. Vibius C.f. Pansa (90 BC) AR Denarius (3.85g) Rome, Obv. 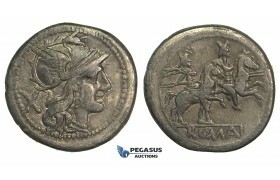 : Laureate head of A..
O50, Roman Republic, C. Licinius L.f. Macer (84 BC) AR Denarius (3.74g) Rome, Obv. 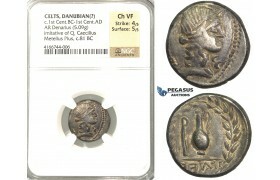 : Diademed b..
O51, Roman Republic, C. Norbanus (83 BC) AR Denarius (3.58g) Rome, Obv. 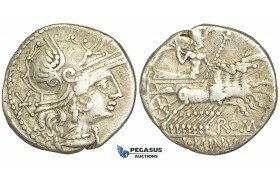 : Diademed head of Venus righ..
O52, Roman Republic, Q. Antonius Balbus (83-82 BC) AR Denarius Serratus (3.76g) Rome, Obv. 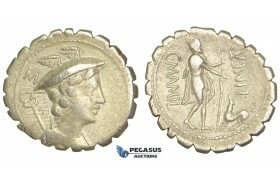 : Laureat..
O53, Roman Republic, C. Mamilius Limetanus (82 BC) AR Denarius Serratus (3.91g) Rome, Obv. 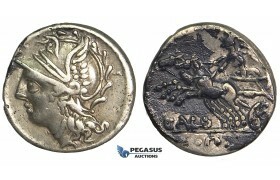 : Draped ..
O54, Roman Republic, L. Procilius (80 BC) AR Denarius Serratus (3.83g) Rome, Obv. 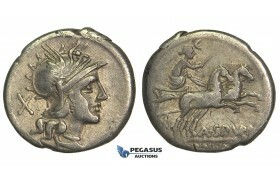 : S C Head of..
O55, Roman Republic, L. Papius (79 BC) AR Denarius Serratus (3.85g) Rome, Juno Sospita, Rare! O55, Roman Republic, L. Papius (79 BC) AR Denarius Serratus (3.85g) Rome, Rare!, Obv. 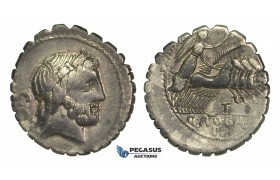 : Head of Juno ..
O56, Roman Republic, L. Aemilius Lepidus Paullus (62 BC) AR Denarius (3.76g) Rome, Obv. 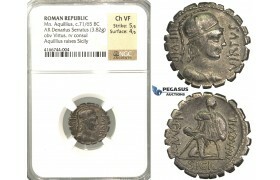 : Veiled and ..
O57, Roman Republic, Q. Servilius Caepio (M. Junius) Brutus (54 BC) AR Denarius (3.77g) Rare! 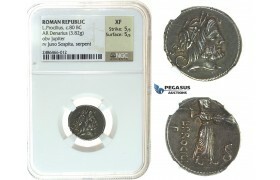 O57, Roman Republic, Q. Servilius Caepio (M. Junius) Brutus (54 BC) AR Denarius (3.77g) Rare!, ..
O58, Roman Republic, Appius Claudius Pulcher, T. Manlius Mancius, and Q. Urbinius (111-110 BC) AR De..
P02, Roman Republic, Q. Antonius Balbus (83-82 BC) AR Denarius Serratus (3.90g) Rome. Obv. 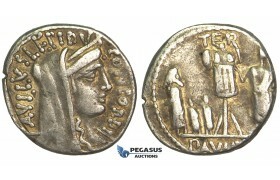 : Laure..
P03, Roman Republic, L. Censorinus (c. 82 BC) AR Denarius (3.73g) Rome, Obv. 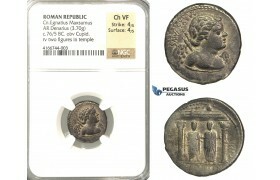 : Laureate head of..
P04, Roman Republic, Cn. Egnatius Maxsumus (76 BC) AR Denarius (3.70g) Rome, Obv. : Bust of Cup..
P05, Roman Republic, Mn. Aquillius (ca. 71/65 BC) AR Denarius Serratus (3.82g) Rome, Obv. 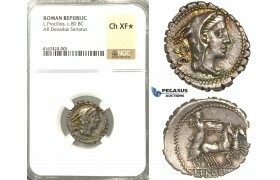 : Hel..
P06, Roman Republic, C. Piso Frugi (67 or 61 BC) AR Denarius (3.64g) Rome, Obv. 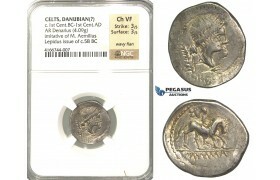 : Laureate head of A..
P07, Geto-Dacians?, AR Denarius, Barbaric Imitation of Metellus (5.09g) Contemporary Imitation of Q..
P08, Geto-Dacians?, AR Denarius, Barbaric Imitation of Lepidus (4.09g) Contemporary Imitation ..
R396, Roman Republic, Q. Caecilius Metellus (130 BC) AR Denarius (3.85g) Rome, Quadriga Obv. 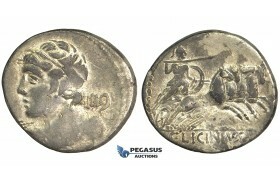 : Helme..
U96, Roman Republic, L. Procilius (80 BC) AR Denarius Serratus (4.08g) Rome, Obv. 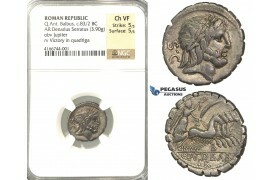 : S C Head of..
V04X, Roman Republic, Q. Sicinius & C. Coponius (49 BC) AR Denarius (3.82g) Obv. 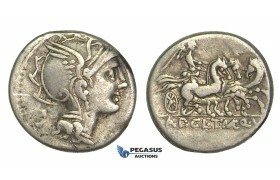 : Head of Apollo..
Y68, Roman Republic, Q. Fabius Labeo (124 BC) AR Denarius (3.82g) Rome, Quadriga, Fine Patina! 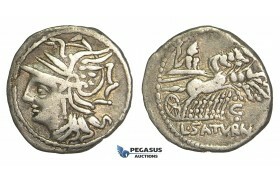 Y68, Roman Republic, Q. Fabius Labeo (124 BC) AR Denarius (3.82g) Rome, Quadriga, Obv. 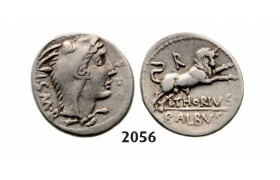 : Helmeted hea..
Y69, Roman Republic, Q. Antonius Balbus (83-82 BC) AR Denarius Serratus (3.76g) Rome, Obv. 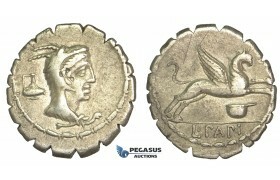 : Laureat..
ZA34, Roman Republic, Anonymous (211-208 BC) AR Denarius (4.33g) Rome, Obv. 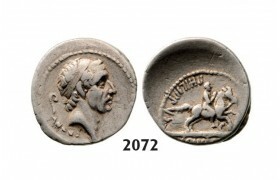 : Helmeted head of Roma r..
ZG25, Roman Republic, C. Mamilius Limetanus (82 BC) AR Denarius Serratus (3.95g) Rome, Obv. 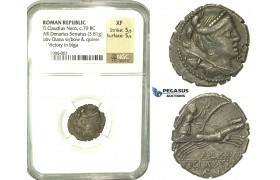 : D..
ZH97, Roman Republic, Q. Sicinius & C. Coponius (49 BC) AR Denarius (3.82g) Obv. 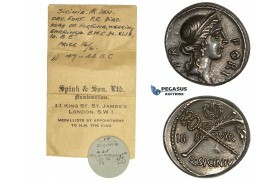 : Head of Apollo..